Oral Fixation’s last show of 2018 is around the corner! That’s right. 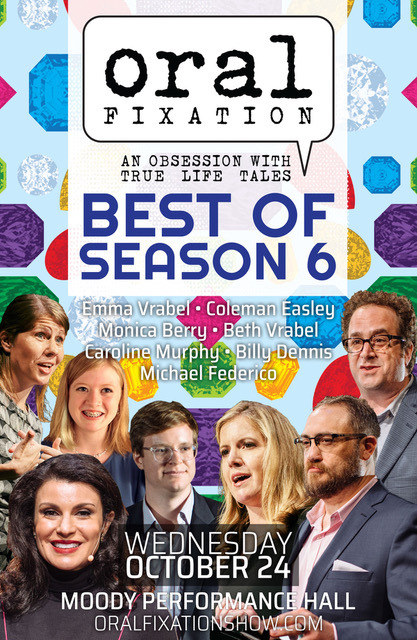 On Wednesday, October 24th, 2018 @ 8pm, seven of the audience’s favorite stories from Season 6 flesh out a simply sensational evening. Whether you’re a longtime fan of true stories told onstage or a total newbie, get ready to be taken on a wild emotional ride. Make a night of it in the Arts District while catching up on the best stories from Season 6. $35 tickets are on sale now!“Best of Season 6” will be held at 8:00pm on Wednesday 10/24 at Dallas City Performance Hall, 2501 Flora Street, Dallas, TX 75201. Show runs 75 minutes with no intermission. $5 self-parking is available at One Arts Plaza or park free at a meter on Ross. Tickets are $35 and can be purchased online or at the door. Gayle Bell’s work has been featured in numerous anthologies, print and online publications. In 2018 she performed “Black Betty, That Thangs Gone Wild”, with Cara Mia’s Storytellers, Building Communities. In 2013-2014 Sse was a co-docent for “My Immovable Truth-A Dallas Lineage”. She facilitated her and other GLBTQY’s oral history and performance, sponsored by (MAP-Make Art With Purpose) and displayed at the African American Museum in Dallas TX.